Unsurpassed in authority, reliability and accuracy; the 2018-2019 edition has been fully revised and updated to incorporate all relevant legislation for consumer and commercial law courses. 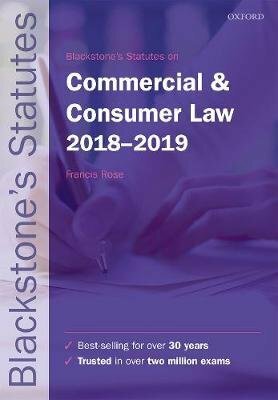 Blackstone's Statutes on Commercial & Consumer Law is an abridged collection of legislation carefully reviewed and selected by Professor Francis Rose. With unparalleled coverage of consumer and commercial law, Blackstone's Statutes on Commercial & Consumer Law leads the market: consistently recommended by lecturers and relied on by students for exam and course use. Blackstone's Statutes on Commercial & Consumer Law is: - Trusted: ideal for exam use - Practical: find what you need instantly - Reliable: current, comprehensive coverage - Relevant: content reviewed to match your course Online resources The accompanying online resources include video guides to reading and interpreting statutes, web links, exam tips, and an interactive sample Act of Parliament.